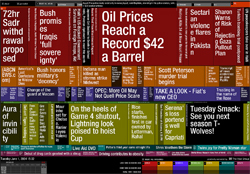 The Newsmap is a highly interactive website that uses Treemap technology to show the relative amount of coverage of international news stories by category and country. Professor Ben Shneiderman's (CS/ISR) Treemap software makes the news again, this time as a component in software that Sun Microsystems, Inc., is using for visual analysis of its global quality and marketing initiatives. Fraser Arnot, the architect of the first treemaps at Sun said, "We quickly realized that this application's key attribute was the ability to identify the critical few from the trivial many, which in today's business world is becoming harder and harder to do. In addition, we were surprised that we could use it in so many areas of the business."